Come April, 2011, and there would be a war for a throne which was being commanded by the Kawasaki Ninja 250R for the past more than one year. The challenger.... the new for the calendar year 2011, Honda CBR 250R. But will the Honda CBR 250R have enough steam to de-throne the mighty Ninja which has had an experience of more than 20 years of being the best in the class? As can be very clearly seen that with a Bore x Stroke ratio of 76 x 55 mm (1.381:1) the Honda CBR 250R engine is slightly lower than that of the Kawasaki Ninja 250R at 62 x 41.2 mm (1.504:1), which means that the peak torque of the Honda CBR 250R would be coming at slightly lower rpms than the Kawasaki Ninja 250R. A quick look at the peak torque figures proves the point, as the CBR 250R develops it's peak torque at 8000 rpms and the Ninja 250R develops it's peak torque at 8200 rpms. The Kawasaki Ninja 250R with a compression ratio of 11.6:1, gains over the Honda CBR 250R which has a compression ratio 10.7:1. This means that the Ninja 250R has better thermal efficiency and is able to extract more mechanical energy from a given mass of air-fuel mixture. This translates into the fact that the Ninja 250R would be able to build speeds quicker than the CBR 250R. Clearly, with it's Parallel Twin configuration and higher compression ratio, the Kawasaki Ninja 250R wins over the Honda CBR 250R by a handsome margin. But here we need to consider the fact that even though running on a single cylinder mill, the Honda is generating a very healthy power number, but the Ninja clearly zips ahead by numbers. Just imagine what fun it would have been to ride the Honda CBR 250RR, producing 40 HP at 14500 rpm, with Transverse four cylinder DOHC motor (with some contemporary styling of-course)!! Even though a single cylinder motor, the CBR 250R with 22.9 Nm Torque at 8000 rpm generates marginally more torque than the Ninja 250R with 22 Nm Torque at 8200 rpm. 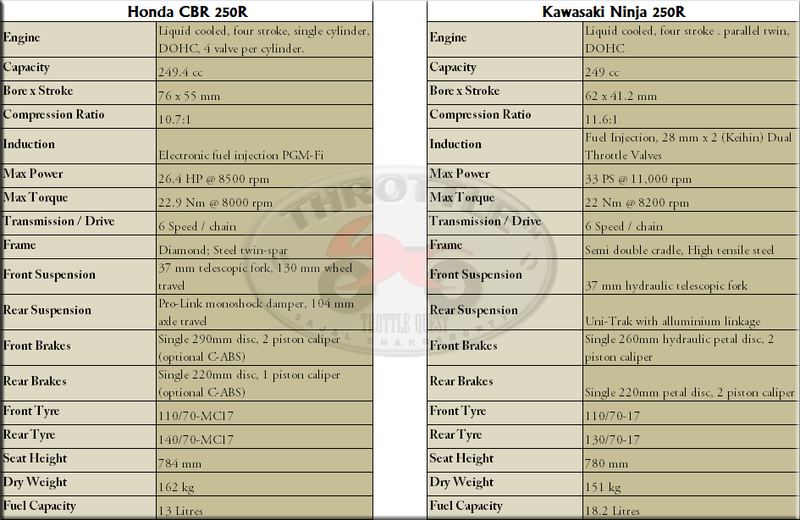 So, clearly the CBR is higher on torque than the Ninja with it's configuration. So, apart from the engine, the most visible and prominent difference between the Kawasaki Ninja 250R and the Honda CBR 250R is the presence of optional C-ABS on the later. This, from my point of view is a great feature to have in any motorcycle and going by the reviews I've heard from people owning the Honda CBR 1000RR Fireblade with the C-ABS feature, this thing works like magic and is very confidence inspiring. So, price factor apart, anyone who decides to go for the Honda CBR 250R, must go for the C-ABS version of the bike, it's worth every extra penny shelled out. The Honda will sell being nearly half the price of the Ninja. But clearly the Ninja is the winner on the performance scale. And the Ninja is 11kilos lighter too! You are absolutely right. Personally, the only thing I find attractive in the Honda is the C-ABS, but still given a choice I'll any day pick the Ninja. Is 162 the "Dry weight" of the CBR250R..?? The Ninja 250R has a "Kerb Weight" of 172 Kgs.. which makes it a bit heavy actually. Yeah, 162 is the "Dry Weight". With all parameters constant, the Ninja250 has a fuel tank capacity, 5.2l more than than CBR250, which why the Kerb weight comes more on the Ninja. Both the bikes have only the cubic capacity in common. 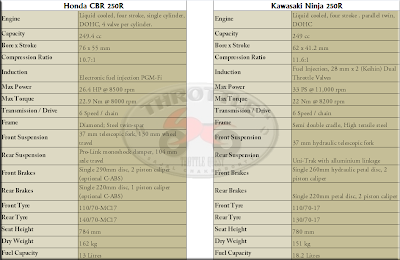 Technologically, they both are quite different, the major difference being the twin cylinders in Ninja compared to single in CBR250r, at the same time CBR boasts of a counter balancer that reduces the vibrations at higher rpms,as per information its lot less buzzier than the Kawasaki. The redlines of the bikes are also different, ninja goes 2000 rpm higher. However, CBR delivers better torque at lower RPM an important criteria for indian conditions.India is a country with diverse demands and requirements,Honda being cheaper stands a better chance, ninja on the other hand is definitely overpriced relatively. So as far value for money is concerned Honda is a way better choice. Ninja will definitely have takers, but the Honda will have more in india atleast. The equations as far as asian(excluding india), european and american market is concerned is pretty different. It would be nice see the reception Honda gets in india. Till then we just have to wait, but in any case a shootout is definitely the cards despite the different power values. i am not sure where exactly everybody lives but up here in canada the price for the 2011 ninja and the 2011 cbr250 are both $4,999.99. The International price of the Honda CBR 250 is the same as Ninja as Honda is seeing Ninja as it's sole competitor and as Subrat said above, the equations internationally and in India is completely different. In India too Honda is seeing Ninja as it's sole competitor and is being much more aggressive than Internationally. The only reason why Ninja seems so over priced is that the Ninja comes in CKD format, so the parts are imported from Indonesia and assembled locally at Chakkan. But for the Honda CBR 250, the entire motorcycle is being made locally at Manesar, Haryana, and which places a huge huge difference in pricing. Both are great bikeso there's no problem. What the heck for trivial things ! @Rahul : Take look at the Aprilia Factory RSV4 SE. It's loaded with all kinds of electronics along with ABS and it's a full blown track day bike. I still wonder why the US still hasn't got the Fi version of the Ninja as most of the comparison between the CBR 250R and the Ninja 250R are being done with the carburetted Ninja which in my honest opinion is quite unfair!! After reading all facts, expressed by bike lovers i come to the conclusion that cbr 250 is better in safty and comfort with speed and ninja 250 is better in pickup with better speed. But the ABS factor and width of rear Tyre for better grip makes cbr 250r a slight better under control bike. For a bike if have capacity of quick acceleration, we must have equal capacity to brake. Dude, the feedback of the C-ABS of the Honda CBR 250R hasn't been so great. The front end geometry of the CBR 250R makes the front end dive quite abruptly at high speeds when goes full on on the rear brake, which is very unlike the C-ABS performance that there on the CBR1000RR and the CBR60RR. Expert reviews put the braking speeds of the Ninja 250r & the C-ABS version of the CBR 250r as equal - both stopping from 60mph in 143ft. Well it's true that in an expert's hands, the C-ABS on the Honda CBR250R would be like a toy and therefore there observation of equal stopping distance on both the bikes. This actually speaks well about the braking capabilities of the Ninja. IN INDIAN ROAD I ALSO CONFUSED ABOUT HONDACBR250 AND NINJA,PRICE IS NOT A MATTER,IN BETWWEN TWO,BUT WHICH ONE IS BEST,PREVIUSLY I HAVE YAMHA125(2STOKE)BULET,NOW KARIMA.WANNA CHANGE NOW. Both, the CBR 250R and the Kawasaki Ninja 250R are equally potent machines on Indian conditions. Being a Karizma owner currently, you would find yourself more at home on the CBR 250R, it has very relaxed ergos, little bit better torque and very smooth engine, just like the Karizma. But if you want more performance, a similar experience to the super sports class, then Kawasaki Ninja 250R should be your tool, because of it's immaculate handling, planted feet, stiff chassis, peaky engine. So, just chalk down, what's your expectation is from the 250cc class, and you would find zeroing down to a bike very easy. honda cbr is by far the better choice on indian conditions. its better to be practical than being too excited about top speed & power which cannot be utilised... most of the time you ride your bike. paying up such a huge amount for ninja just only for top speed makes no sense. Rightly said, that in Indian conditions, we should be paying more attention to practicality than to pine for top speed which we are hardly able to hit in day to day life. Considering that Ninja has 17-liter fuel tank capacity compared to 13 liters of CBR so it should have a longer range on a tankful but as CBR is a single cylinder unit, it should compensate some by having better fuel efficiency. Also as it makes more torque at lower RPMs and also has longer stroke engine, it will call for lesser downshifting of gears which will again mean better fuel efficiency for Honda CBR, so according to me Honda CBR 250R is the clear winner in the best India bike war. Thanks dude to leaving your comment. dude, so what do you think abt the KTM which is gonna b released soon...! which wud be better on account on perfomance and all?? Not sure from where did you came to know that the Euro spec CBR makes 33bhp... as I for one didn't came across any such specs. I double checked on the Honda UK website and it mentiones 19.42kW which is somewhat equal to 26Bhp, where as the Indian spec makes 25Bhp, only a difference on 1Bhp, with the same Torque and Weight ratios, and that hardly makes any difference overall. err my mistake i guess; thanks for the reply tho ..although wish honda trained their sales staff better as my sales guy revved the new motor hard on first startup! as if a bajaj scooter before i had to point him out(in the manual as well!) a new engine needs to be treated with care ..wish they educated themselves more or not be in a job destroying other peoples machines from their ignorance..
Well, blasphemy is the single most prevalent attribute amongst the support staff of most motorcycle manufacturers. It's more so, because these people treat the motorcycles not as objects of great passion, but merely as boroline... nikaal ghisa and done. Can't help it much and you did the absolute right thing by stopping that person. I am planning to buy a bike...Had a pulsar 150 for 3 years...now I've narrowed my search to three bikes. r-15, cb2(the least acceptable) and ofcourse my love,ninja! I am just worried about the traffic...Is the ninja easily maneuverable in heavy or light traffic? btw,i dont want to go for honda since the customer sale guys are all idiots and freaks in vadodara..Probiking is much better...Please do let me know. Duke 200: Feels compact (too much for my comfort, have been riding ZMA for years). Feels gruff and eager but peaks out too quick. Ninja: Virtually useless for daily rides on traffic congested roads. Feels sluggish under 8K rpm, after which it seems to turn into Hulk from a tiny Dr.Banner (I rode the green one!). But by then you'd have to put brakes because you suddenly realize ur in India. CBR250: Feels more at home with comfortable ride position and power delivery. The ABS does not 'feel' as safe as it 'sounds'. Sounds almost like your regular 200s but is a lot more quicker. Out of the three this seems to be the most logical bike for India.